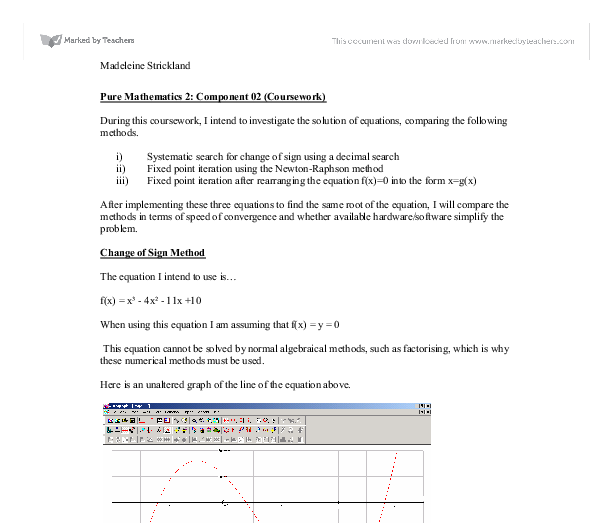 During this coursework, I intend to investigate the solution of equations, comparing the following methods. After implementing these three equations to find the same root of the equation, I will compare the methods in terms of speed of convergence and whether available hardware/software simplify the problem. This equation cannot be solved by normal algebraical methods, such as factorising, which is why these numerical methods must be used. 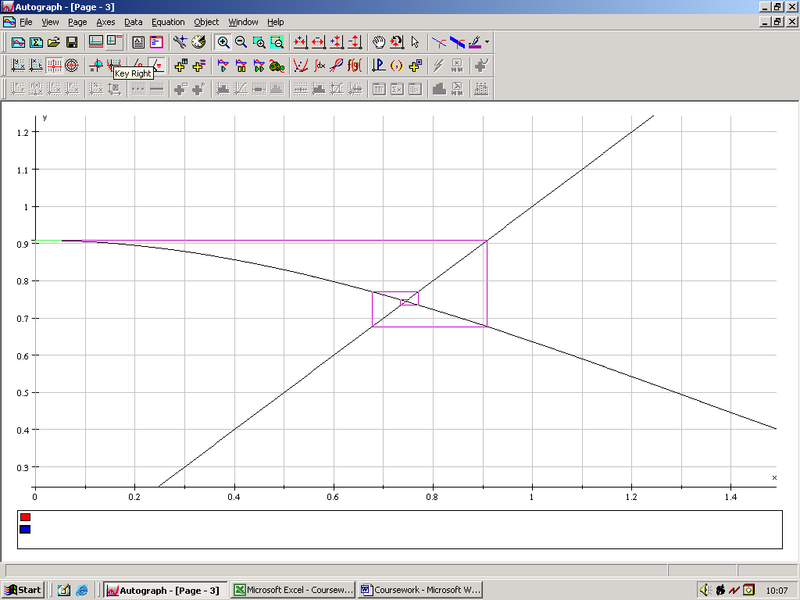 Here is an unaltered graph of the line of the equation above. If y changes sign in an interval, a root lies in between that interval. I know for a fact that there is a root between 0 and 1 as the lines cuts the x-axis (where y=0) somewhere between those two points. There is a change of sign between these points, which further confirms my theories. The table showing the change of sign to 4 decimal places shows that the change of sign occurs between 0.7448 and 0.7449. . So, the root is 0.74485 plus or minus 0.00005. This is true to 4 decimal places. I therefore need to show this graphically. I have demonstrated this in the graph below. 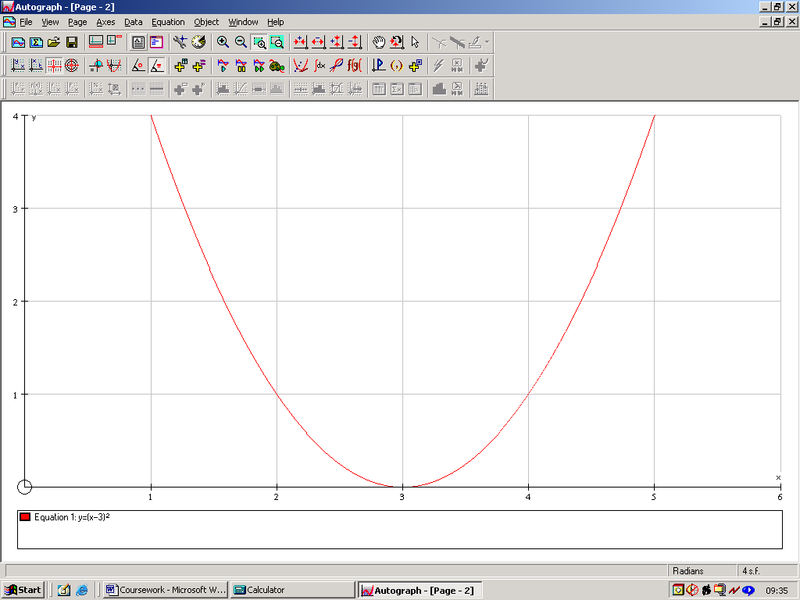 It clearly shows that the line cuts throught the x-axis in between 0.7448 and 0.7449. Where this method fails: Although this was successful, this cannot be said for some other examples, one of which I will demonstrate. I will use a parabola as an example. 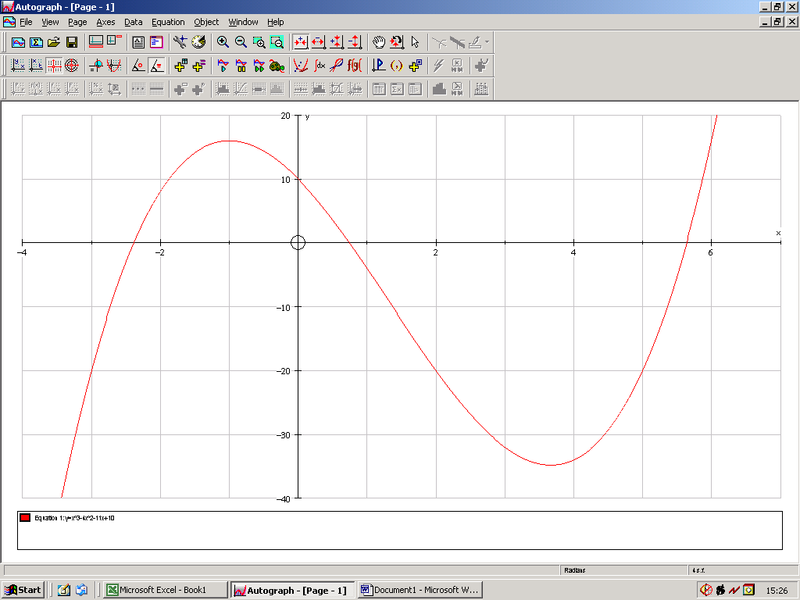 If I take the equation y=(x-3)², it is obvious that this is a parabola as a minimum. This means that it only touches the x-axis at one point. It is a repeated root. If the change of sign method is used at any point, the sign will never change as the entire parabola is positive – never crossing the x-axis. 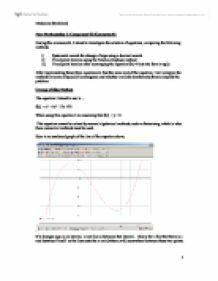 I will now compare how the three methods manage to find the same root, the speed of convergence to find that root and how easy each method is to implicate with the software and hardware present. Earlier, I found that a root of y=x³-4x²-11x+10, is 0.74485 plus or minus 0.00005. I will now find the same root using the Newton-Raphson method (using 0 as the starting point). So, there has been repetition to four significant figures and these four figures are the same as that of the earlier method (0.7448). This has been successful. I will now employ the rearrangement method, using the same starting point (0). This has created a cobweb diagram. there is a sign change and then setting the new limits as such. But regarding the speed of convergence, this is relatively low as it is not completely automated and requires human interaction after each set of results and is very repetitive. 6=a3+b (1) 9=a4+b (2) 3=a (2)-(1) Substitute 'a' back into (1) 6=3x3+b 6=9+b b=-3 Substitute 'a' and 'b' back into original equation. S=3C-3 This means the second number equation is produced by S=3C-3 And since the third number has exactly the same increase as the second number the equation is exactly the same. has to be worked out so as to find the intervals where there is a sign change within them. The location of the interval can be achieved by substituting the value of x in to the equation f(x) = 0.
x1 = 0.5 x2 = 1 x3 = -1.148698 x4 = -1.268010 x5 = -1.346816 I can immediately see that there is no convergence in this rearrangement towards the particular root I am looking for, that I found in the previous rearrangement (Rearrangement 2). But that one's repeated root. The decimal search method does not show between those values any change, because curve touches y-axis on that particular point, so there we have no change in sign, as well. Above we can see interval [0,1] and root which lies there.